Harold Lloyd in a 1928 promotional still for Speedy. Harold Lloyd, along with Charles Chaplin and Buster Keaton, forms the trio of film performers who defined the silent comedy technique. Each had his own approach, resulting in different tones and situations. 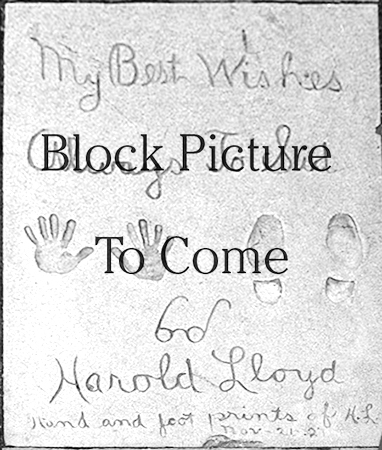 Harold Lloyd's films are among the funniest films ever made. Born in Burchard, Nebraska, in 1893; when Harold was 17, his parents divorced, with his father taking his son with him to San Diego. Having acted as a child, Harold started hanging around an Edison unit filming in the area. 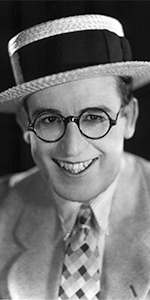 At age 20, Lloyd moved to Los Angeles, and got work at Universal, where he met Hal Roach. The two created a character for Lloyd to play called "Lonesome Luke"; these films were released under the Hal Roach banner, and were moderately successful. However, Lonesome Luke was too much like Chaplin's "Tramp" character, so Lloyd and Roach sought to create a persona for him to play which was more unique. Roach had thought Lloyd too handsome to play comedy successfully, so "Lonesome Luke" wore a mustache and funny clothes. Having Lloyd wear glasses and everyday clothes changed everything. The Harold Lloyd we know today as the "Everyman" character is upbeat, optimistic to the point of danger, continuously striving, accident prone, and above all — romantic. Lloyd began making films with the "Everyman" character in 1917. All of his films at this point were shorts, which were still the best vehicle for comedy. But like most of the really creative people working in pictures, Lloyd wanted to try the more ambitious problem of tackling the feature-length film. Grandma's Boy (released in September, 1922), was a hour long, and proved to Lloyd and others that a longer comedy with all the story dynamics of a regular play — comedy mixed with drama — could work for audiences. It was also a huge hit, so feature films became the new goal. The very next year, Lloyd created his masterpiece Safety Last! (released in April, 1923), which would forever create the image of Lloyd's talent for the ages, as he is seen hanging from the hands of a town clock on the side of a building. The stuff of legend. After parting the ways with Hal Roach, Lloyd set up his own production company in 1924, continuing to release his films through Pathé: Girl Shy (released in April, in 1924), and the incredible The Freshman (released in September, 1925). Starting with The Kid Brother (releassed in January, 1927), Lloyd's films were released by Paramount. For them, Lloyd made Speedy (released in April, in 1928). In all, these films made Lloyd one of the wealthiest men in Hollywood. Lloyd made the transistion to sound films, starring in Welcome Danger (released in October, 1929), which did very well, but with the onset of the Depression, Lloyd's "Everyman" character was no longer in sync with the times; solving the problem of making comedy during this time took longer and longer to figure out, and before long, audiences were no longer as interested. In 1947, Lloyd, director Preston Sturges, and producer Howard Hughes made a "comeback" vehicle called The Sin of Harold Diddlebock, the production of which was such a stormy affair that Hughes shelved the result for years. In retirement, Lloyd, living in his enourmous Beverly Hills mansion Greenacres, devoted his energies to Freemasonry, the Shriners, Christmas Trees (he had them set up all year long, it seems), and his great love, photography. Lloyd passed away in 1972, age 77.